The status defines different project states and degrees of completion. You can find the project status in the project, on the Manage page, in the Status / Date area. Click Project Statuses. Below you will the Project Statuses area. 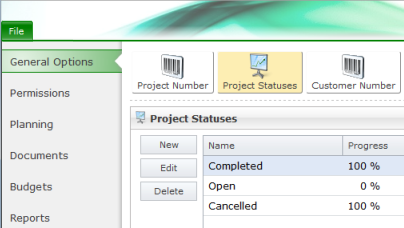 Remove the selected project status from InLoox PM Web App by clicking Delete. The project statuses list contains the name and progress of each status. The sequence of this list corresponds to the sequence displayed in the projects, on the Manage page. How to change the project status in InLoox PM 7 Web App • Copyright 1999-2019 © InLoox GmbH. Tous droits réservés.